I’m as much of a romantic as the next person, but I ask you, patience, kindness, are one thing, and maybe you’ll get lucking and be able to avoid being envious or boastful, arrogant, or rude, and good luck to you if you do. But never insisting on your own way, never being irritable or resentful, bearing all things, believing all things; please give me a break. Show me a couple who don’t ever engage in a battle of wills, or build up resentments, or succeed in bearing and believing everything about one another, well, that couple is in all likelihood headed for some serious trouble. My darling Carol is perfect in every way, and I of course am perfect in every way and we are sublimely happy, so happy that birds sing when we walk by and flowers stand tall in our saintly presence…Of course not! Carol is the love of my life and being married to her is the best thing that ever happened to me. But I am annoying to live with. I have a job that interferes with our life together on a regular basis. When I’m on a role, I can be arrogant and rude. Even though I’d never say a bad word about Carol, especially from the pulpit, I will tell you this, if Carol was never, boastful, arrogant, or rude, if she was always patient and kind, never insisting on her own way, never irritable or resentful, well I don’t think I would be able to live with her. That’s not the kind of love that any of us could live with, let alone be in love with. I want a real-life partner, someone who will engage me in all of who they are, the good and the bad, the beautiful and the not so beautiful, for better or for worse, in sickness and in health. I once heard agape defined as the kind of love that seeks the best for the other without regard to one’s own standing in the relationship. In other words, agape is a love that expects nothing in return. Agape is a love that is beyond emotion. Agape is beyond emotion because it has become compassion, or empathy. Agape is the kind of love that we only catch glimmers of in this life. Agape must be embodied in order to be. Agape is embodied, compassion, embodied empathy, embodied love. Agape is beyond description, impossible to fully define and yet we would all recognize agape when we experience. Agape is a dream; a dream embodied and enacted. Agape is the LOVE that we call God. Agape is the LOVE that we call God embodied and enacted in the world. Agape encompasses eros, philia, and storge, and all the emotions that go along with these loves and is more than the sum of these parts. Agape is Beyond the Beyond, for Agape is God. God is LOVE. When I was a child, I spoke like a child; I thought like a child, I reasoned like a child; when I became an adult, I put an end to childish ways. When I was I child, I thought that love was something I need to learn or to find or to do. As I become more fully human, I am learning to put an end to childish ways. Pierre Terhard de Chardin wrote that, “Love is the very physical structure of the universe.” Tehard believed that at the very heart, at the core of all reality was God who is Love, the source of all that is, the core of everything is LOVE. 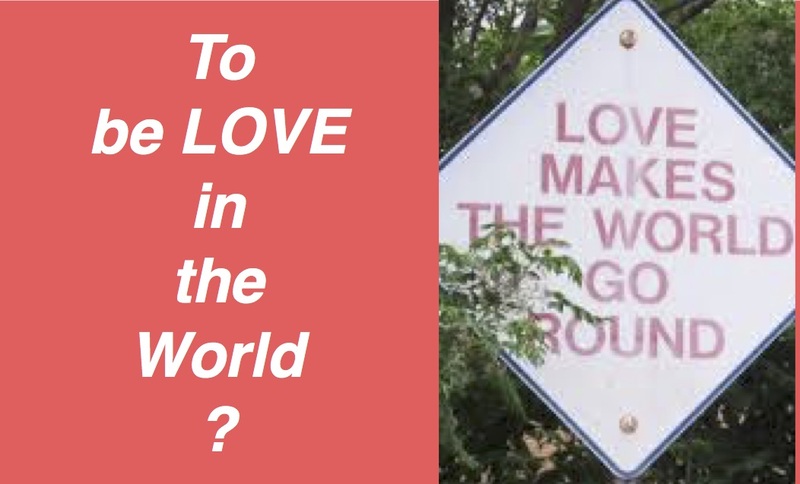 Michael Morwood has taught us that, “after 13.8 billion years of evolution, the divine is at work in the universe, coming into expression in us.” If we are created in the image of God, then Love is what we were made for because love is who we are. Is it any wonder then that love becomes known when we see ourselves in the other? The embodiment of LOVE is achieved when we who are made of LOVE, recognize ourselves in the other, because LOVE is not something that we do, LOVE is who we are. LOVE bears all things, believes all things, hopes all things, endures all things, LOVE never ends. Now we see in a mirror dimly, but then we will see face to face. When we recognize ourselves in the other, we are the embodiment of love. Now we know only in part, then we will know fully, even as we have been fully known. When we recognize ourselves in the other, faith, hope, and love abide, these three; and the greatest of these is LOVE. This entry was posted in Adult Education, Evolutionary Christianity, Progressive Theology, SERMONS, STORIES, Theology and tagged 1 Corinthians 13, progressive Christian sermon Epiphany 4C, progressive sermon 1 Corinthians 13, progressive spirituality, progressive theology by Rev. Dawn Hutchings. Bookmark the permalink.